Excellent coffee along with English Breakfast and Green tea are available 24hrs per day. Our Free ‘’All you can eat’’ Pancake breakfast we remain very proud off, we let you cook it and we don’t take notice of how much you have, seems a good deal to me. To accompany the Pancakes on offer from 5am to 11am, we include Rolled Oats and Fresh Bananas. We have a well-stocked, spacious and available 24hrs a day Guest Kitchen, lounge areas for watching movies, hammocks by the garden, a ping pong table, large tables for those group meals …and of course the Swimming Pool. An on-site travel agency can take care of that must do trip to the “San Blas Archipelago” and we can also put you in-touch with our people who arrange great boat trips from Panama to Colombia. Our air cons run 24hrs a day, and so does our reception and the guest kitchen if you need it. There is no curfew, so long as you return quietly, and we also offer free luggage storage while away for up to three weeks for all guests. Our dorms vary in size from 6 bed ensuite to 8 and 12 beds, and if 12 beds seems too much for you don’t worry, it’s a good sized room giving you lots of space to arrange your things before the next leg of your journey. Our private rooms are small and cosy, the best we could do with the space we had, and they have proven to be perfect for the needs of most of you. 24hr air con keeps you cool but if outdoors is your thing, the chilled out garden area is only metres from your door. We prefer things to quieten down from 11pm onwards and are not a party hostel but if fun is what you are after, we encourage that too. Just be respectful of your fellow guests is all we ask. We offer a very relaxed and chilled out environment for people to come and enjoy what the city has to offer, while seeking information from our knowledgeable staff. The Metro Bus stops just 50mtrs from the hostel and the Metro Train is an easy 5min walk away. Uber is increasingly popular in Panama and offering fantastic prices to navigate this very spread out city, for $3-$5total you can be in most places you would want to be. A fantastic deal for door to door service right? We have a decent and enjoyable selection of restaurants close to us, places where you can enjoy the budget prices Casco Viejo no longer offers while also mingling with friendly locals and seeing the authentic side of how Panamanians live. Well stocked mini markets are minutes away and open until 11pm and the Supermarket is 10mins walk. Our Fridge is always stocked with super cold well priced Beer so no need to bring your own if you feel lazy. So come visit Roxana, Marialina and their hard working team and let us show you the true spirit of Panamanian hospitality. We know we will not always get it right, but you can be assured that we will always be doing our best to make your stay, and time in Panama City, the best we think it can be. Not sure on any of the above, or have further questions, just let us know. We are here for you 24/7. 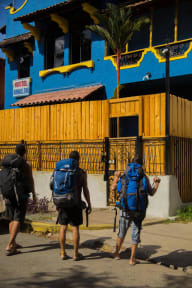 Mamallena in Panama-city is a great hostel. There is plenty of space to relax and meet some other people. The pancake dough is nice for in the morning. The staff was really friendly. Great place for staying in Panama City. Staf has a good knowledge and is extremely friendly and helpful. Nice place to stay in Panama City. Especially because of the staff: they make you feel at home and help you find your way around. Showers are cold but its warm enough in PC anyway. Rooms are clean and beds comfortable. Fijne hoge kamers, bedden alleen soms wat ingezakt. Ontbijt is fijn om zelf te maken, alleen moet je soms lang wachten voordat je aan de beurt bent. Er is maar 1 echt fijne pan namelijk. Verder denkt personeel wel goed met je mee en ze zijn erg behulpzaam! Location outside the centre of the city but easy by taxi. The room was clean and comfy, and though there is no air conditioning there we had two fans in de room. The outside garden has nice hammocks which makes it a great place to relax. This hostel is perfect for those that want to save some money on location. Mamallena in Panama City is a good hostel. The vibe is just right, the make-your-own-pancake breakfast is great and the staff is super nice. The location might not be the best, but it doesn't take that long to go into the old town either. Could surely recommend. We really liked this hostel. We had a small room and the atmosphere was really nice. We had a good breakfast and we were able to relax near the pool and the option to drink a beer and play. Although we only stayed one night, it is a good hostel! Heel leuk hostel qua mensen/personeel, alleen waren de douches en wcs heel vies (de helft deed het niet of waren verstopt). Wel is er net een zwembad geopend dus dat is heel fijn in de warme stad! Erg leuk voor solo travelers, je ontmoet veel mensen en je hebt veel plekken om met elkaar te chillen! Netjes en schoon hostel met gezellige tuin voor en achter. Ontbijt wat het hostel aanbied bestaat alleen uit pannenkoeken. Douches zijn koud en het personeel en de sfeer ook.